Pictured from left are: Richard Aylard from the award sponsors, Thames Water; Pete Turner from the Environment Agency; and Shaun Leonard from the Wild Trout Trust. An Environment Agency-led project in Yorkshire has been recognised by the Wild Trout Trust at its 2015 Conservation Awards in London. The Upper Aire Land Management and Habitat Project won the award for best large-scale habitat enhancement scheme. The Environment Agency has been working in partnership over the last five years to tackle diffuse pollution in the Upper Aire catchment, which runs through the Yorkshire Dales National Park. Working with the Yorkshire Wildlife Trust and the Yorkshire Farming and Wildlife Partnership has enabled the project to tackle the issues with landowners and farmers. The most common causes of water pollution are rain water that runs off agricultural and urban land, and the discharges of waste water from industry and sewage overflows. Starting with demonstration plots to prove the benefits, the project has worked with 15 landowners to carry out work such as fencing buffer strips, visited over 50 farms to advise on nutrient management and planted 27 hectares of woodland. These actions not only reduce pollution but also help to slow the flow of flood water and improve the quality of habitat for wildlife. This has been an amazing project to be involved in and it goes to show what can be achieved with great partners. Our rivers are the healthiest for 20 years, and we are working hard to maintain what we have achieved so far and to further improve water quality and biodiversity. The work that Yorkshire Wildlife Trust and the Yorkshire Farming and Wildlife Partnership have done to engage landowners and promote the project has been fantastic. I hope this award will raise the profile of the project further and bring in even more partners in the future so we can continue delivering benefits in the area. A significant reason for the success of this project was the use of direct proof of its benefits to potential partners via demonstration plots. This was made possible by the buy-in of early adopters and, in combination with a highly passionate team, resulted in numerous farmers actually requesting to be included in the project. Congratulations to Pete Turner and all of the Environment Agency team and the partners working on this project. Over the next five years the Environment Agency will work in partnership with water companies and others to improve 6,000kms of rivers and 50 bathing waters. The Conservation Awards recognise and encourage excellence in the management and conservation of wild trout habitat, celebrating the efforts, skills and ingenuity of projects carried out both by professionals and by grass roots voluntary organisations. 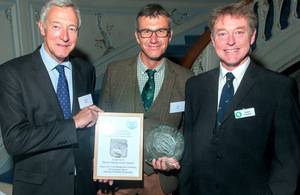 For more details on the winners of the Wild Trout Trust Awards visit the Wild Trout website.